The SmartKey can be turned in the ignition lock even if it is not the correct SmartKey for the vehicle. The ignition is not switched on. The engine cannot be started. - inside metallic objects, e.g. a metal case This can impair the functionality of the KEYLESS-GO key. Do not keep the KEYLESS-GO key in the temperature-controlled cup holder . Otherwise, the KEYLESS-GO key will not be recognized. Vehicles with KEYLESS-GO are equipped with a SmartKey featuring an integrated KEYLESSGO function and a detachable Start/Stop button. The Start/Stop button must be inserted in the ignition lock and the SmartKey with the integrated KEYLESS-GO function must be in the vehicle. Pressing the Start/Stop button several times in succession corresponds to the different key positions in the ignition lock. This is only the case if you are not depressing the brake pedal. If you depress the brake pedal and press the Start/Stop button, the engine starts immediately. The Start/Stop button can be removed from the ignition lock. Then, you can insert the SmartKey into the ignition lock. • electrically powered equipment can be operated. The engine can be turned off while the vehicle is in motion by pressing and holding the Start/Stop button for approximately three seconds. As soon as the ignition is switched on, all the indicator lamps in the instrument cluster light up. If an indicator lamp does not go out after starting the engine or lights up while driving, see . 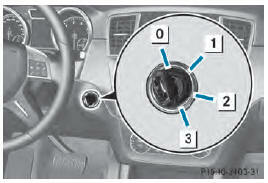 ■ Insert Start/Stop button 1 into ignition lock 2. When you insert Start/Stop button 1 into ignition lock 2, the system needs approximately two seconds recognition time. You can then use Start/Stop button 1. ■ If Start/Stop button 1 has not yet been pressed, this corresponds to the SmartKey being removed from the ignition. ■ Press Start/Stop button 1 once. The power supply is switched on. You can now activate the windshield wipers, for example. The power supply is switched off again if: • the driver's door is opened and • you press Start/Stop button : twice when in this position. X Press Start/Stop button : twice. The ignition is switched on. The power supply is switched off again if: • the driver's door is opened and • you press Start/Stop button : once when in this position.